Bondic Repair Liquid Refill | BUDK.com - Knives & Swords At The Lowest Prices! Here's a solution to fix virtually anything in your home that's broken whether it's indoors or outdoors. The Bondic solution is an incredible, solvent free adhesive that dries clear and creates a permanent bond. It stays liquid until cured with the included UV LED light. It's a 100% waterproof and heat-resistant tool that you will find many uses for. Bond, build, fix and fill virtually anything in seconds. Bondic works on : plastic, wood, metal, PVC, steel, rubber, wiring, ceramic, figurines, vinyl, Kevlar, polypropylene and leather. 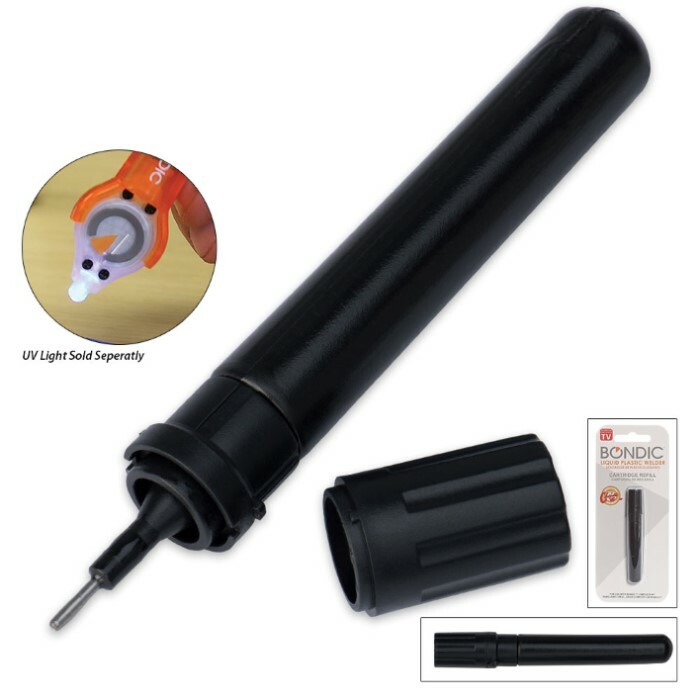 This it a refill cartridge for the Bondic Repair tool.